I’m still working on my minimalism project. Woohoo! But I’m having a really hard time letting go of a few things and cannot pinpoint exactly why. My husband said it’s emotional attachment, which is why I cannot find an actual reason. I started collecting jeans for this quilt years ago, I think even before I met my husband. 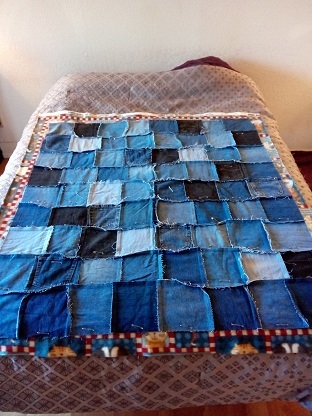 I saw a denim quilt on HGTV and instantly fell in love. However, when I started working on the quilt, I made a mistake in choosing to include pockets. At first I thought it would be a really cute addition. 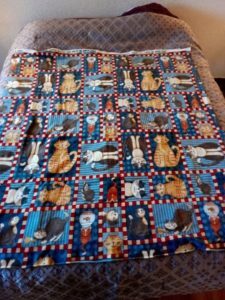 But when I started the actual quilting, I found that it was almost impossible to quilt around the pockets or through them. Quilting through them ruined the ability to use the pockets but quilting around them looked really bad on the cat side of the quilt. Now, at 35 years of age, this is not really my style of quilt. But I think the sentimentality makes it impossible to get rid of it. I’ve been working on the quilt, either collecting the jeans, sewing together the jean patches, or working on the quilting itself, for over a decade. Obviously I don’t love the project. So why can’t I let it go? Something as stiff as blue jeans only needs a line of quilting at the edges of the blocks. I have done that a number of times with cottons. With today’s batting, you don’t need to do all the close quilting that my grandma used to do. Another option is to tie it off with yarn spaced at corners of patches. Just get it done and donate it if you don’t like it. Or donate the partially done thing and see if someone else will love it. That is what letting go is about. You don’t have to do everything, be everything, control everything, and especially you don’t have to be perfect. The quilt I just finished I could have kept for just me, but posted all my imperfect efforts because I have mostly let that go and posting it helped me admit it!